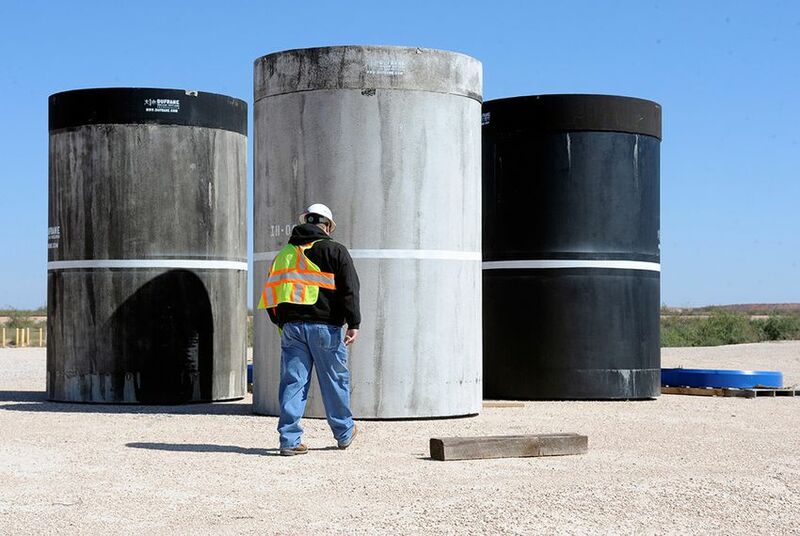 A federal judge has blocked the purchase of the company that runs Texas' only nuclear waste dump — a setback in its proposal to accept spent nuclear fuel from across the country. A federal judge has blocked a Salt Lake City-based company’s purchase of Waste Control Specialists, further jeopardizing the Dallas company’s plans to expand the nuclear waste dump it operates in West Texas. U.S. District Judge Sue L. Robinson of Delaware on Wednesday sided with the federal government in blocking a $367 million merger between EnergySolutions and the radioactive site’s parent company. Waste Control Specialists calls the deal essential for its long-term viability. The details of Robinson's opinion were sealed. The U.S. Department of Justice sued in November to block the merger of rival companies, arguing it would essentially create a monopoly on radioactive waste disposal. Waste Control Specialist expressed disappointment in the decision and said it was considering whether to appeal. “WCS has built the nation’s state-of-the-art facility for low-level radioactive waste disposal, and the acquisition will protect desperately needed American jobs and innovation and ensure the continued operation of this facility,” Rod Baltzer, the company’s president and CEO, said in a statement. Waste Control Specialists, which currently stores low-level radioactive waste in Andrews County, has a pending application with the U.S. Nuclear Regulatory Commission to store tens of thousands of metric tons of spent nuclear fuel currently filling up reactor sites across the country. The company has pitched the massive expansion as a solution to a problem that has bedeviled policymakers for decades. But in April, it asked the regulators to pause their license review because the company was bleeding cash amid the merger lawsuit. Wednesday’s ruling is the latest setback for a project that the company initially suggested it would start constructing by 2019. For months, Waste Control Specialists was the only company in the country officially seeking to build a temporary storage facility while the federal government grapples with finding a permanent disposal site for spent nuclear fuel. But in April, a New Mexico group submitted an application to the Nuclear Regulatory Commission to build a facility, just across the state line from Andrews. In a 2014 letter to his then-fellow state leaders, Rick Perry — who championed the WCS expansion as Texas governor — cited competition from New Mexico as he urged them to move ahead with the project. He now heads the U.S. Department of Energy, which plays a major role in advancing and implementing policy on nuclear waste. Opponents of a nuclear waste expansion suggested Wednesday's ruling could thwart the project altogether — unless Perry somehow gets involved. "The WCS site is not a safe place to store deadly high-level radioactive waste," Karen Hadden, executive director of the Sustainable Energy and Economic Development Coalition, said in a statement. "Texans and those along transport routes shouldn’t have to suffer the health, safety, security, financial and environmental risks that transport and storage of the nation’s most dangerous radioactive waste would bring."